Three astronauts aboard the Shenzhou-10 spacecraft are ready to run experiments after successfully docking with China's orbiting Tiangong 1 space module. NBCNews.com's Dara Brown reports. A Chinese spaceship made a successful automated docking with an orbiting module on Thursday, marking one more small step toward full-fledged space station operations. The Shenzhou 10 spacecraft completed the procedure for docking with the Tiangong 1 module at 1:18 p.m. Beijing time (1:18 a.m. ET), delivering China's three latest spacefliers to their temporary home, the Xinhua news agency reported. This was the first docking maneuver of the Shenzhou 10 mission — which was launched Tuesday, representing China's fifth crewed spaceflight since 2003. Tiangong (which means "Heavenly Palace" in Chinese) has been circling the planet for almost two years as a test platform for docking and orbital operations. In 2011, two unmanned, automated dockings were conducted, and the crew of Shenzhou 9 made two test dockings last year. Three hours after docking, Shenzhou 10's three crew members — including Nie Haisheng, Zhang Xiaoguang and China's second woman astronaut, Wang Yaping — opened the hatch and floated inside the module. During the current 15-day mission, Shenzhou 10's crew is due to conduct scientific and technical experiments aboard Tiangong 1 and deliver a lecture to students back on Earth. The spacefliers are also scheduled to unhook from the module and come in again for a manual docking. Tiangong 1 will remain in service for only another three months, Xinhua said. China plans to deorbit the module later this year, and then send up more advanced labs for further testing. Beijing's space strategy calls for the creation of a full-fledged space station by 2020. China is not a participant in the 15-nation International Space Station project, in part because of U.S. opposition. 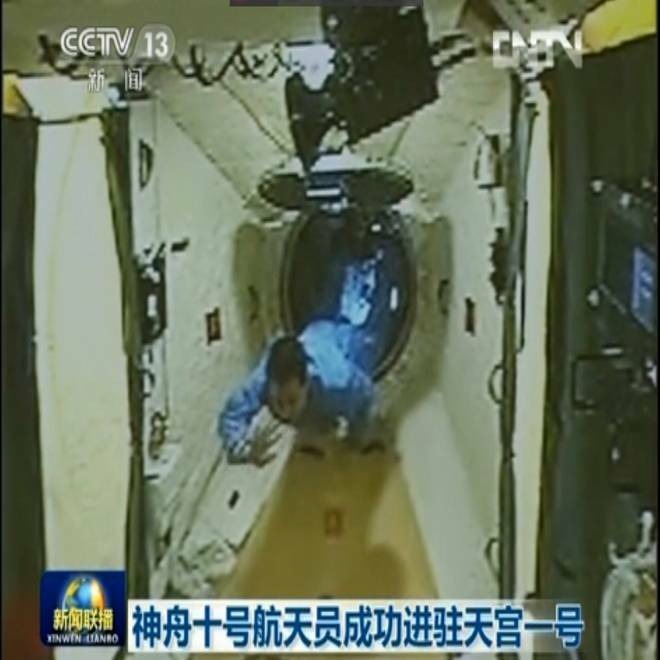 This still photo taken from China Central Television shows Chinese astronaut Nie Haisheng entering the Tiangong 1 space module on Thursday.